I just received an old J-38 straight key. How might I wire this to a 1/4" plug to use in my IC-718?? The J-38 should have two binding posts at the rear of the key. One binding post is connected to the moving parts of the key such as the arm and pivot points. Find this binding post with an VOM set to ohms. That binding post should be connected to the shield of the 1/4" phone plug. That way the parts of the key that you could easily touch should be at ground potential. The other binding post should be connected to the tip contact of the 1/4" phone plug. At the rear of the key itself (not the black bakelite base) you will see two binding posts. The one nearer the picture is the "hot" side and the one farther away is the ground side. The two posts on the black base should be ignored. 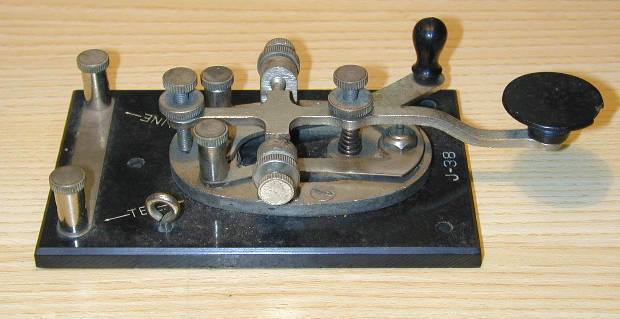 ...and who said amateur radio is dumbed down today? Yeah, I figured that I could wire it one way, and if that didn't work then switch the wires (like I had to do with my iambic paddles. )I thought I'd ask anyway. Thanks for the assist and 73.
by WB2WIK on August 12, 2009 Mail this to a friend! Well it IS complicated. After all there are TWO wires and that doubles the frustration value. In addition to that, what if the key has the contacts closed already? Like for shipping? Can they be opened? Or is the key a bust and should be immediately sent to me? Prepaid. I realize, of course, we don't want anyone using a 1/8" mono plug in a 1/4" inch jack. Maybe if the key is equipped with a 1/8 inch plug it can be wrapped in adhesive tape or duct tape. Remember the days of cathode keying? You did not want the key lever connected to the cathode! Polarity made a big difference. Reminds me, though, of a guy I knew some years back. He asked me to install a hard drive in his computer. He had purchased the hard drive already. And he had fit it into the correct slot. Unfortunately the data cable didn't fit for some reason. So he shaved it down so it would fit. Never occured to him to turn it over, which was all that had been required. So amateur radio is not the only "what's this" hobby? There's some hope there, at least it's a key he's trying to connect. although you won't see many 310 or Bantam sized connectors in Amateur radio. Straight key is simpler, but it ain't easier. Thanks for all of the responses. I'm no engineer, so I just plod along with whatever skills and knowledge that I have. I have been a ham for only about a year-and-a-half. I waited until after I got my Extra Class to set my sights on CW. I've been doing CW, pretty much exclusively, for about 4 months. I'm up to 13 wpm, trying to become a "know code" extra. The straight key adds another challenge, as well as another skill set, to my "tool box." Aside from being a lot of fun, I think CW is just plain cool! I hope to work you guys in the future. My J-38 came with the plug pre-wired. It was SWEET! Then, while setting it up one day, one of the wires came off. That messed THAT sweet deal up! I sent an email to the Lionel company requesting a wiring diagram and they didn't know what I was talking about. They sent me a catalog for model train bridges. Finally my grandson came over and fixed it. He's a sharp kid! This incident occurred during the time that I lost a caster from my cool operator's chair. It would rock back and forth during use inserting errant dits and dahs into my messages causing lots of confusion. Sorry about that digression. In terms of helpful advise, such as I can humbly offer, there are many, many straight keys that are better than the J-38. I started with the J-38 because it was what my dad liked. I now use a couple of different keys, my main is a Bencher that matches my paddle. It can be adjusted to almost work itself. The J-38 I gave to my grandson, who really is a sharp kid. Actually with a straight key it will "work" regardless of which way you connect the two wires. Wiring in reverse however will make the key housing "hot" with respect to the radio chassis. With today's low voltage solid state equipment there is not much danger in that. In the old tube days you might wind up with a couple hundred volts between the key housing and the radio chassis - not good if you get your body between them. After rigging my key with stereo headphone wires (3 wires) I went to the "Shack" (Radio Shack is supposedly dropping "Radio" from its name) and purchased a mono jack. It worked out rather well, especially since the wires weren't so thin. I then screwed my J-38 to a piece of wood to keep it from tipping over as I send. I can say that I have a terrible fist with the straight key as compared to my iambic paddles, but I continue to plod on. One can only improve if one practices. I practice off of the air, then make a QSO or two. It is a blast, though!!! The only "problem" that I have is that when I want to go from straight key to paddles, I have to turn the radio off, then go through the initial setting process for my IC-718. No big deal. I am a member of SKCC, so I look forward to working one of the Straight Key sprints in the future.